Hello! 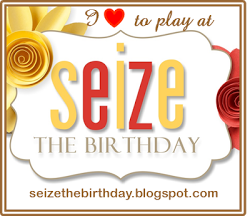 I was playing with the challenge at Tag You're It! 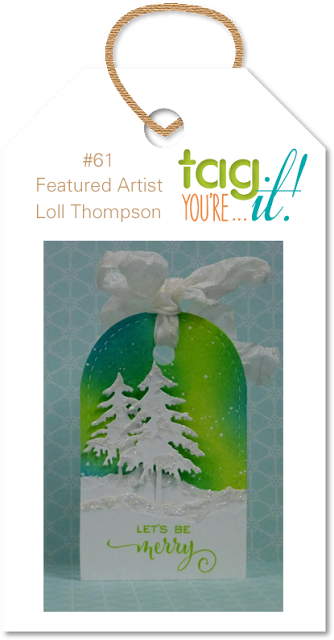 and was inspired by the featured artist Loll Thompson whose tag is shown right. 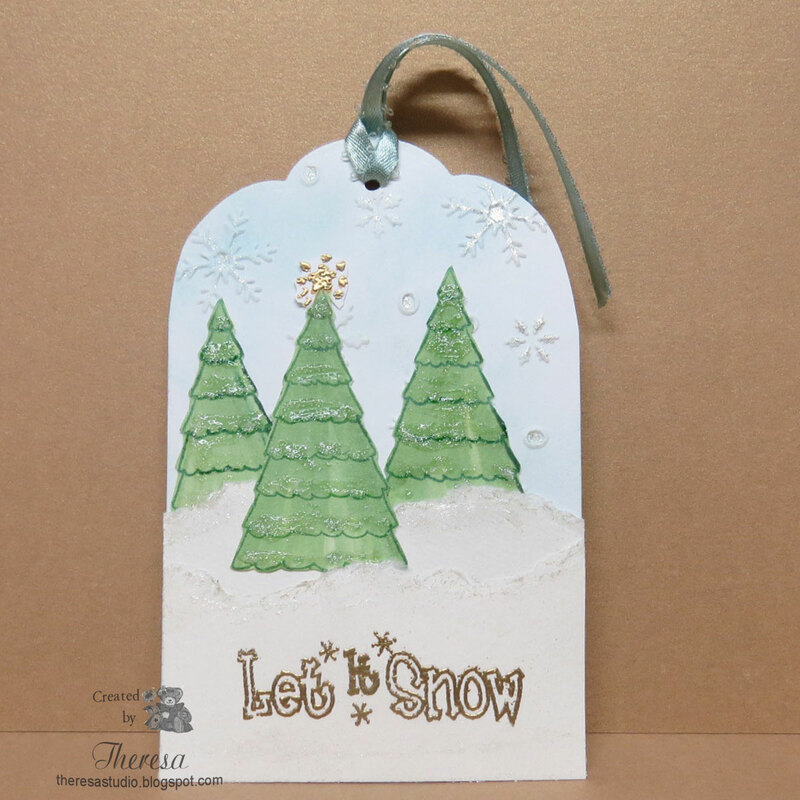 I used her colors but in a different way and pull the theme of trees and snow into my tag. 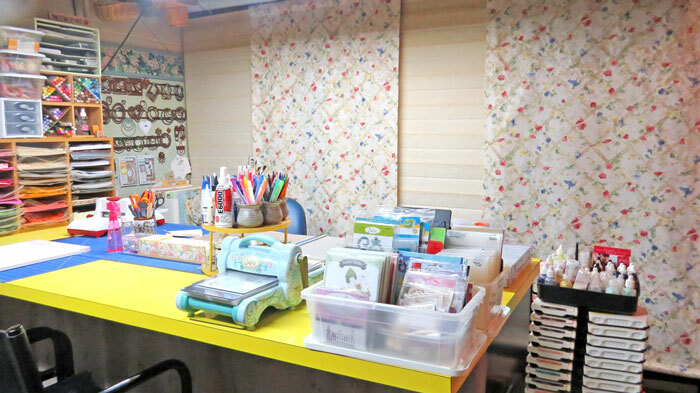 Supplies Used: Creative Vision Stamps, White CS and Watercolor Paper, Memento Inks, Green Copic, Versamark, Gold EP, Stickles Frosted Lace, Blue Satin Loop Ribbon. Hello! I made this card after watching a video by Melanie using her Gina K Design stamps Pressed Flowers and A Year of Flowers 2 using a 2 step technique. The sentiment is from GKD Joyful Holiday. After photographing the card I decided it needed something else so I added gold sequins from my stash shown in the lower photo. Other Supplies: White and Red CS; Memento Lady Bug ink, Versafine Onyx Black; Sakura Gold Metallic pen(for flower centers); Black Marker. Time Out Challenges: #71 Christmas with Optional Twist of Glitter / Shine. 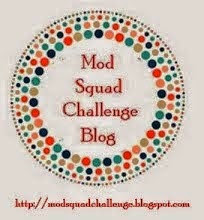 Stamp TV: Mix It Up Monday Challenge It's Your Time to Shine. The sequins and centers of the flower shine. Winter Wonderland : Poinsettias or Snow is falling. Which version do you like best? Sequins or no sequins? Hello! I made this card for the Merry Monday Challenge to use dark blue, light blue and pink on a Christmas card. I used a Christmas Bauble die from Marianne, an embossing folder ( Ornament, Star and Snowflake) by Darice, a Penny Black Stamp from Wonder Collection set with White, Pink and Blue cardstocks. Other supplies: Memento Rose Bud ink, Circle Punch and Die, Pink Satin Ribbon from stash. 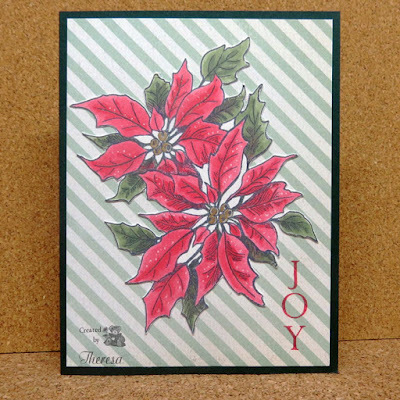 Addicted to Stamps Challenge: #136 Die Cuts and/or Punches. Simon Monday Challenge: Trio-Tastic Use 3 of something on your project. Simon Wednesday Challenge: Simon says Christmas to Die For. 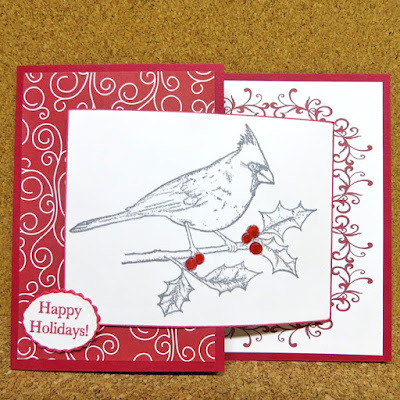 Use die cuts or punches. Hello! 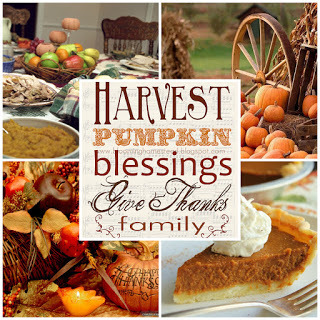 I hope everyone in the U.S. had a great Thanksgiving celebration. I know we enjoyed our Turkey dinner with all the trimmings. 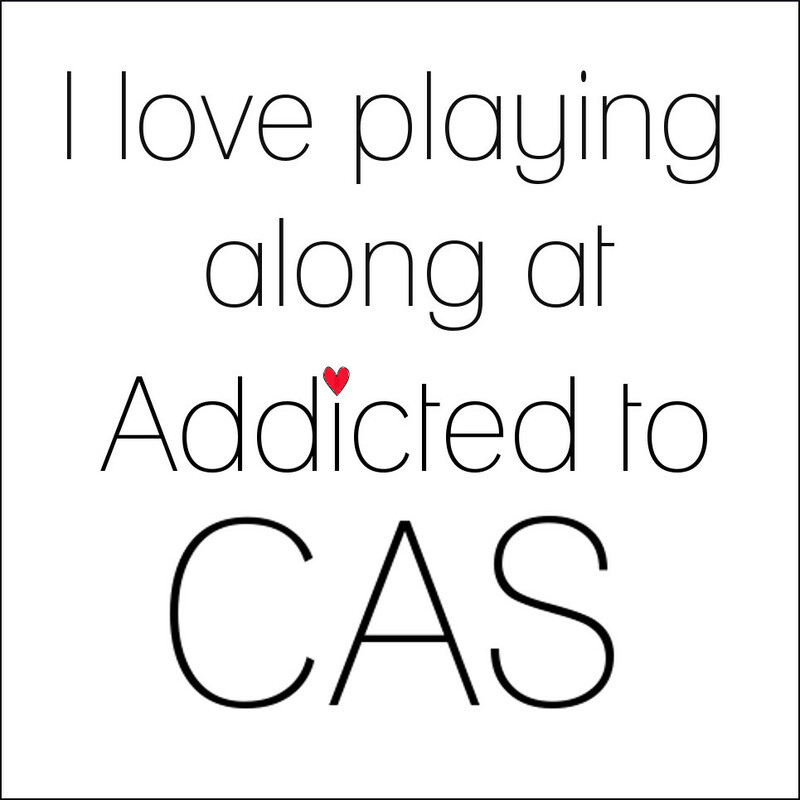 It has been a few days since I posted and I would like to enter this CAS card in a few Christmas challenges. 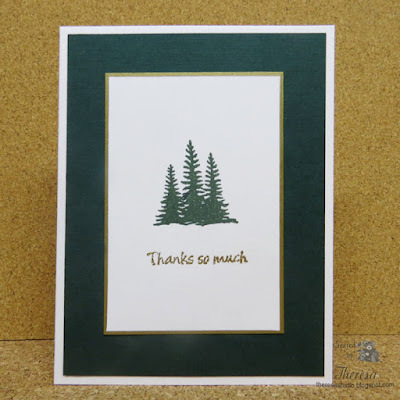 I simply stamped and embossed a couple of stamps from GKD Joyful Holiday set using Gold EP on a white cardstock panel and inked the edges with Pilot Metallic Gold Marker. This was placed on a Red CS mat and then a card base of White CS. I decided to let the great tree design be the star of the card. 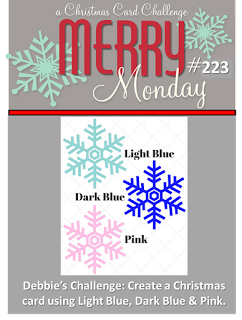 Stamp TV: Mix It Up Monday challenge-make a CAS card that uses ONE Gina K Designs set using ONLY inks that are traditional Christmas colors! 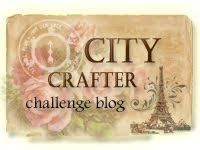 City Crafter Challenge: Week 89 Gold Finger-use Gold. As You Like It Challenge: Favorite Christmas Color Combo....I like the elegant look of red with gold. 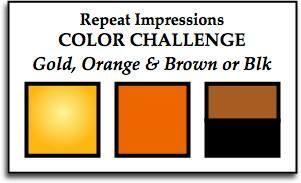 There are so many ways to use these colors to create easy and quick cards. 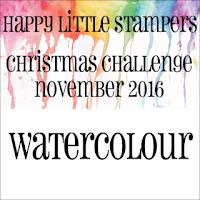 Time Out Challenges: Challenge #71 Christmas with an Optional Twist of Glitter/Shimmer. 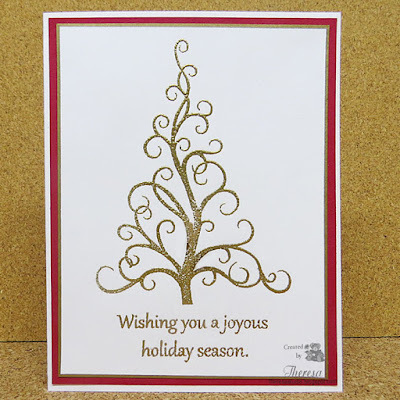 Used Gold embossing and metallic pen for shine. 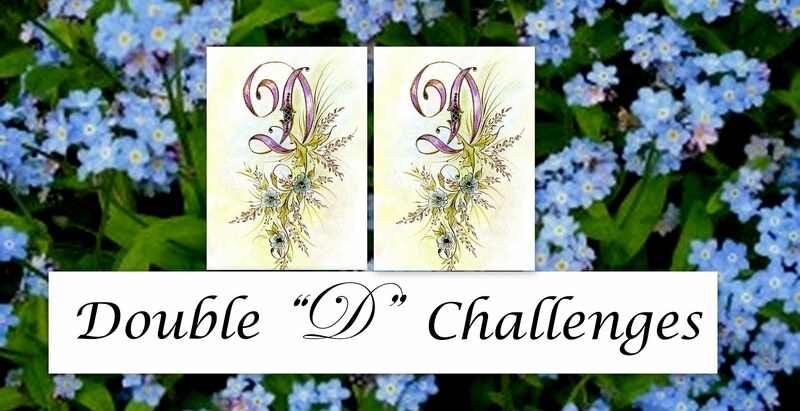 Alphabet Challenge: T for Trees. Hello! I have two Joy Fold Cards today made for 2 different challenges. 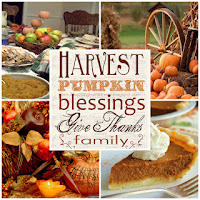 The first is for Stamp TV Mix It Up Monday challenge to make a Thankful Joy Fold card. 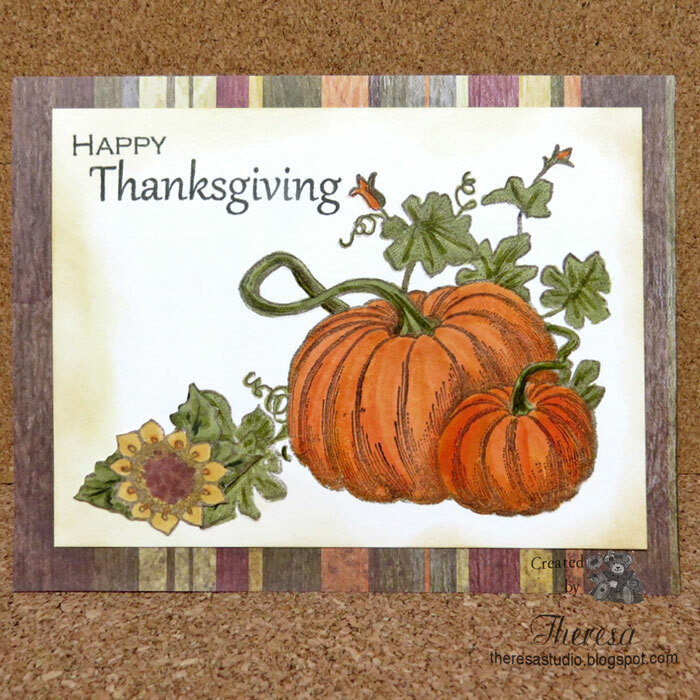 I used pattern papers from GKD The Simple Things and Autumn Landscape pads and GKD stamps from Always Autumn set. Other supplies: Copic Markers, Memento inks, White CS and another GKD stamp from a mystery bag. 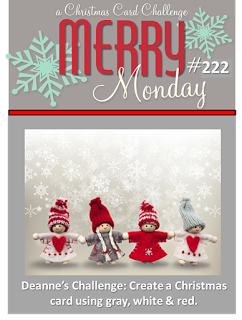 The second Joy Fold Card has a Christmas theme and uses Red, White, and Gray colors for the challenge at Merry Monday. (Missed deadline) I used a pre-printed panel from GKD and GKD stamps from Peace and Joy set. Pattern paper is from Pebbles Welcome Christmas pad and Red and White CS are from stash. Memento Gray Flannel and Rhubarb Stalk inks used for stamping and coloring. 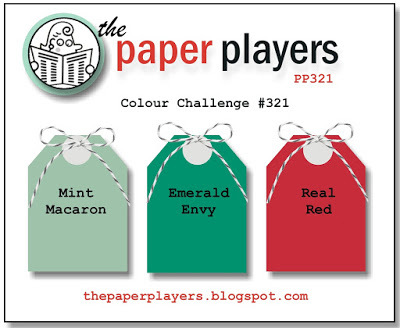 Merry Monday Christmas Challenge: #222 Use Gray, White, and Red OOPS! Missed the deadline. Fussy and Fancy: 177 Different Fold or Shaped cards. Joy Fold cards above. Hello! 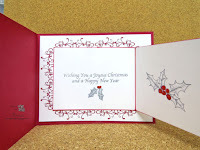 I am back with another post featuring some Christmas cards made with items from Festive Flourishes Luxury Card Kit that came with an issue of Papercraft Inspirations. 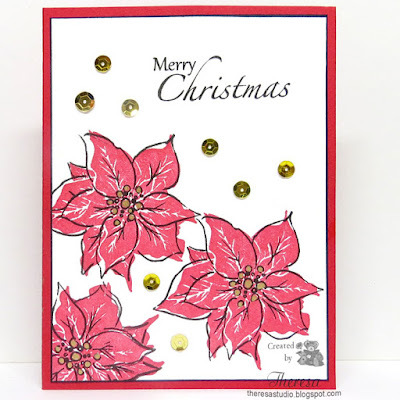 The card stock and toppers both have foiled accents and colors of coral. I finished both cards with a sentiment from Annabelle stamped with Versamark and embossed with Gold EP. Craftyhazelnut's Christmas Challenge: #307 Color: Coral a little bit or a lot. Shopping Our Stash Weekly: Front and Center - use those bits and pieces on your desk that have been laying around, collecting dust. I have had this kit on my desk and decided to use some of the pieces. 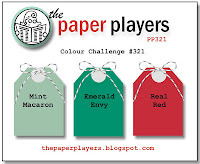 Just Add Ink: #377 Just choose 2 from doily, diecut, designer paper. Used designer papers and diecuts on each of these cards. Hello! I have been making Christmas cards....it's that time of year. I finished up 100 cards (which I have been making all year) to send to Caring Hearts Drive early this week and am now making cards for my Mother. 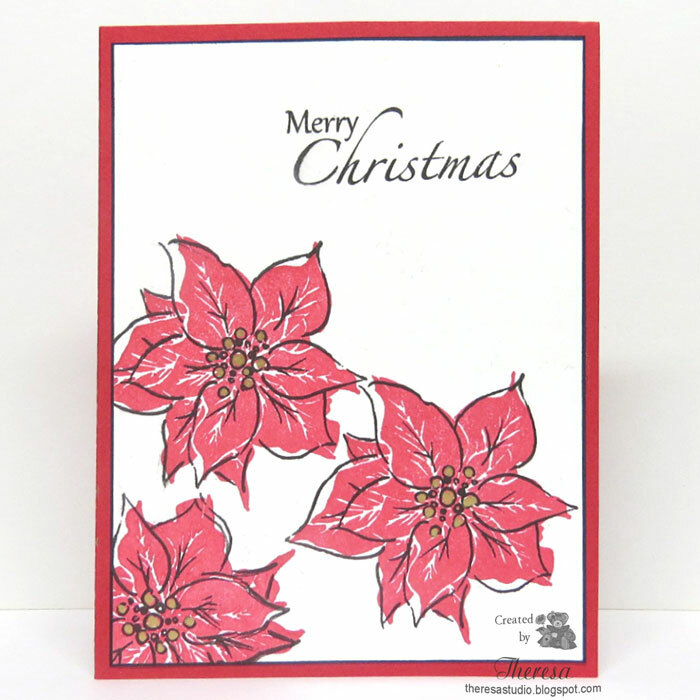 This is one I made for the drive using an old PSX Poinsettia stamp. 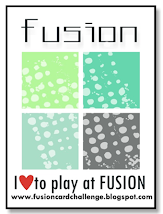 I stamped and colored the image, then fussy cut and attached to a striped paper from MME. 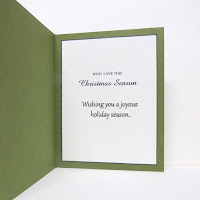 I used a dark green CS for the card base. The word Joy is a GKD stamp. Craftyhazelnut's Patterned Paper Challenge: November Challenge use patterned paper. 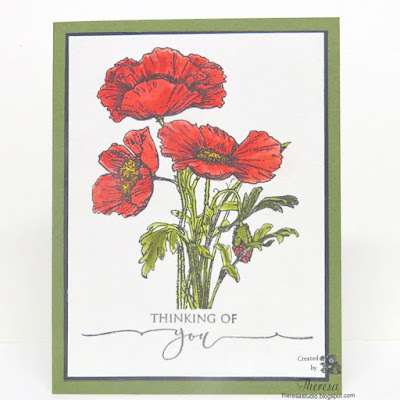 Stay tune for more cards with this stamp which is one of my most favorites. 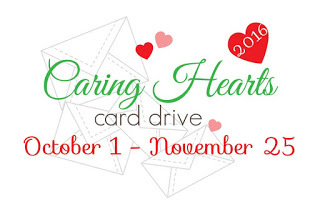 The drive ends on the 25th but you still have time to send cards. Details here. Play Along With Tag You're....It! 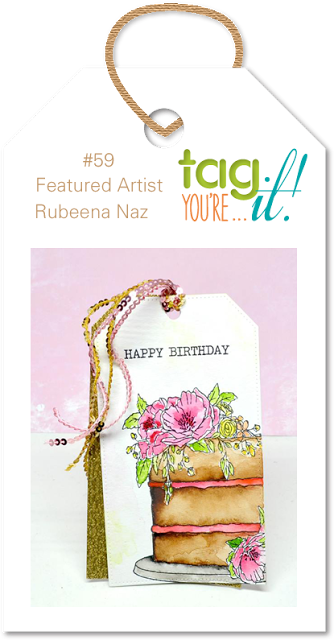 As Guest Designer on Tag You're It, I made a tag for the reminder for challenge #60 inspired by Featured Designer Diane Jaquay shown below. 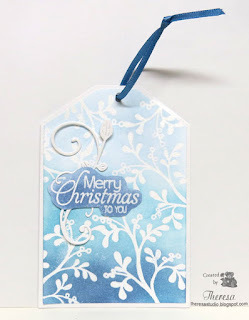 Similar to Diane's Tag, I created an ombre background tag using Distress Inks but used a Christmas theme instead of a Thankful theme. Before sponging the background, I stamped and embossed a Gina K Design Mistletoe stamp with Versamark ink and white EP. I added a sentiment from Annabelle that I also embossed and sponged before trimming. I attached a Flourish die cut from Glossy White CS with a Cheery Lyn die beneath the sentiment. 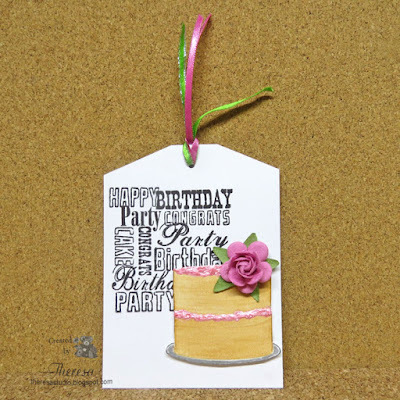 The tag was layered with White Glossy CS and finished with a dark Blue ribbon. 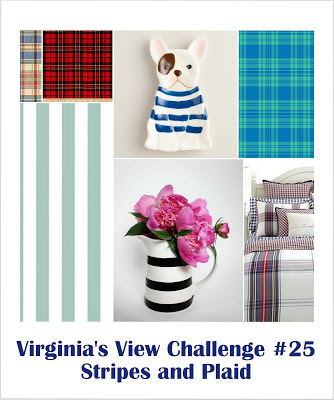 Please check out the challenge and play along at Tag You're It. Hello! 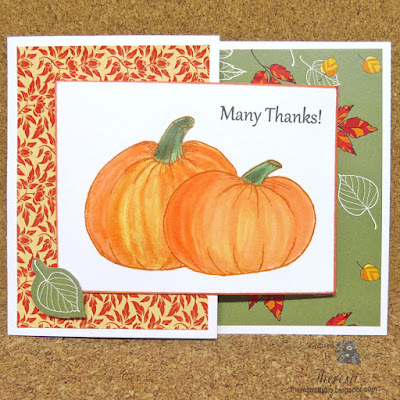 For fall cards, I keep going back to this Pumpkin stamp that I think is PSX and I have had many years. 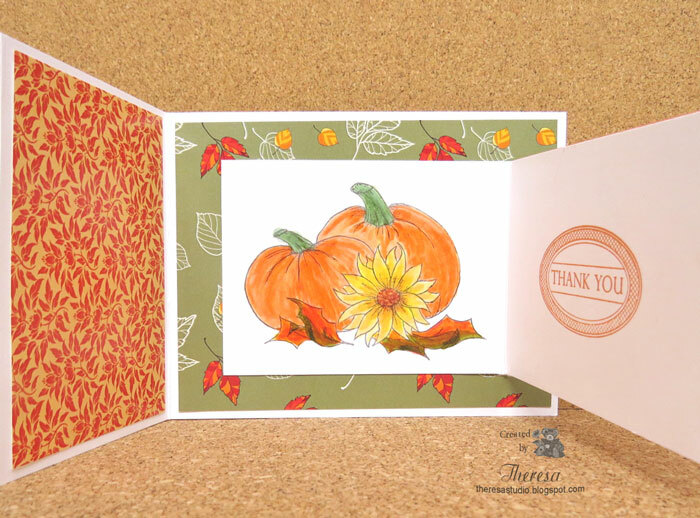 I created this card for several challenges adding a Sunflower to the card with an old MFP stamp. 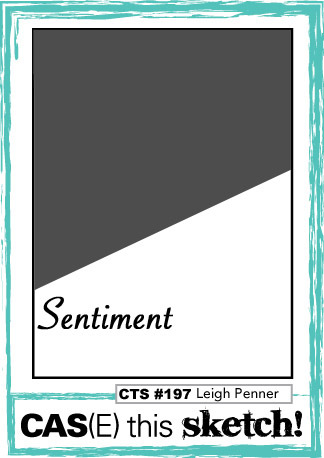 The sentiment is from Gina K Design set. Other Supplies: Papers-GKD Ivory CS, Heartfelt Creations Classic Edition Collection; Inks-Memento Rich Cocoa, SU Always Artichoke, Distress Ink Antique Linen, Copics. Cards In Envy: Just Pumpkins. 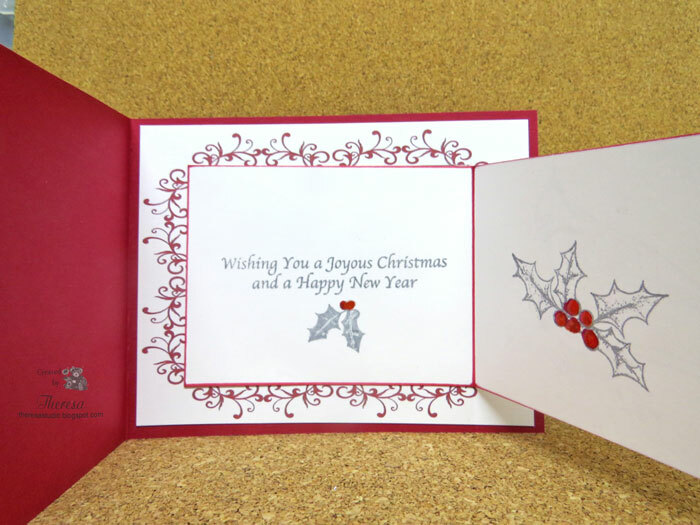 Card is flat for use in an envelope. 2nd entry. 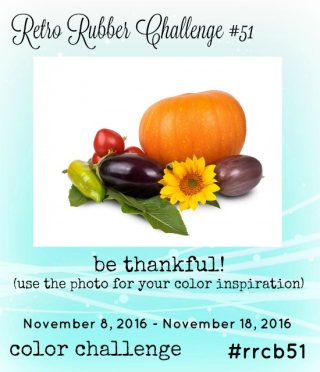 Retro Rubber: Challenge 51 Be Thankful. Inspired by photo to use pumpkin and sunflower. Pumpkin stamp is older than 2 years+ as well as the sunflower stamp. Hello! I was playing with 2 Gina K Design stamps that I won in a Mystery Bag to create a card for the MIUM challenge TREE-mendous. I ended up making two versions. 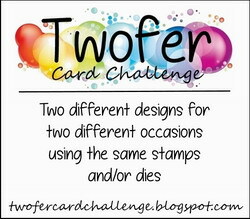 The card on top used one of GKD Perfect Panels which I also won in a challenge. Other supplies used: GKD All Spruced Up CS, White CS; Memento Northern Pine ink, Versamark ink; Gold EP; Pilot Gold Metallic Marker; Sakura Clear Star Pen. Both quick and easy cards. 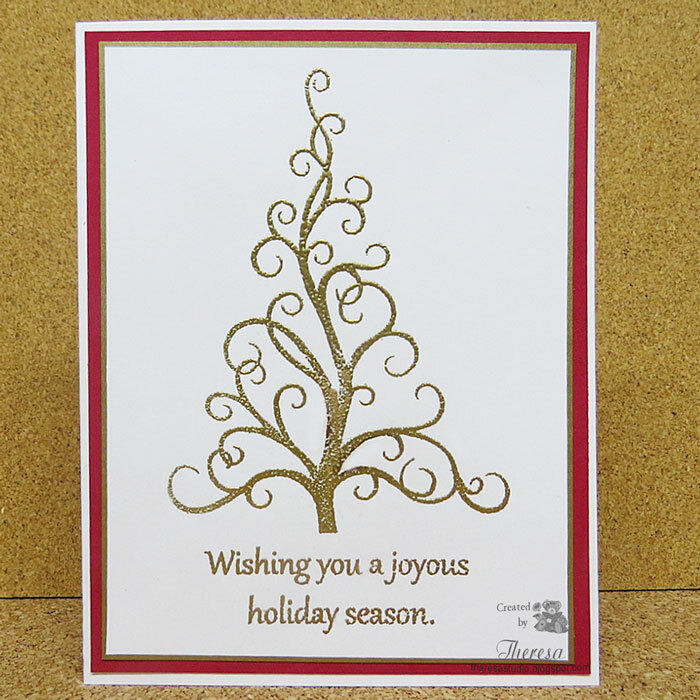 Stamp TV: Mix It Up Monday Challenge TREE-mendous. Susie asked us to use a tree in our design. 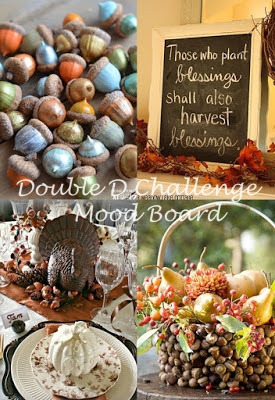 Mod Squad Challenge: Thankful-make a Thank You or Thanksgiving card. Hello! 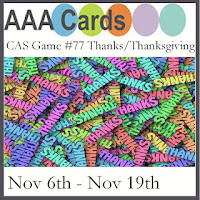 I was inspired by the challenge at The Card Concept photo inspiration shown below to create this CAS card to tell someone that I was thinking of them. I stamped the word Hello using a Flourishes stamp with Versamark and Silver EP on Gray CS that I edged with a metallic silver marker. I attached a cut out of a typewriter from a Crate Paper kit and slipped in some pink vellum that I "typed" with words using some more Flourishes stamps. Added some embossing of dots along the bottom edge. 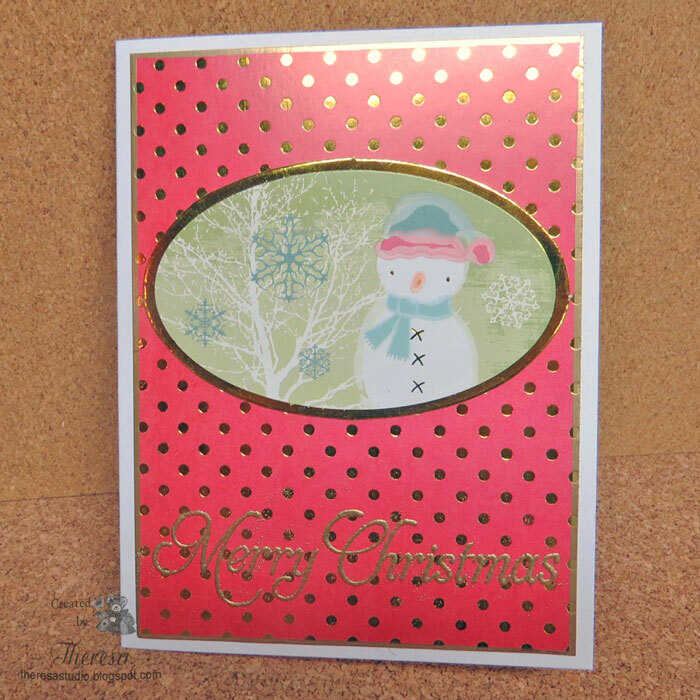 Then I added to a shimmery pink card base to finish my Clean and Layered card. The Card Concept : #61 Pretty in pink. 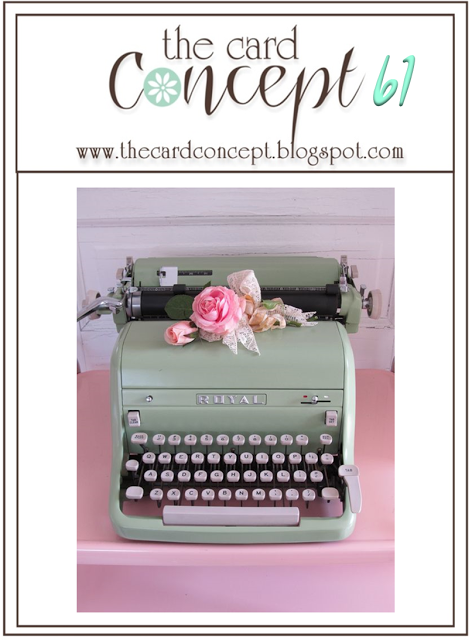 Inspired by the colors and typewriter in the photo. 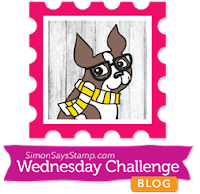 Simon Wednesday Challenge: Simon says Thinking of You. Hello! Another quick and easy card that I made for the WIW color challenge at The House That Stamps Built to use Gold, Orange, and Brown or Black. 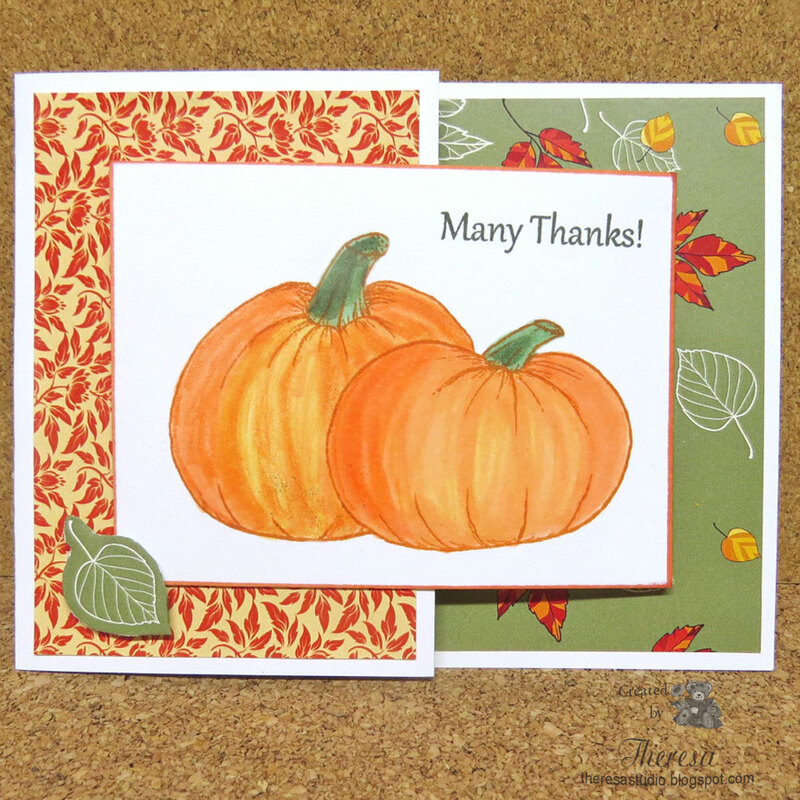 I used Repeat Impressions Vertical Sentiment stamp and Pumpkin stamp on this CAS design. 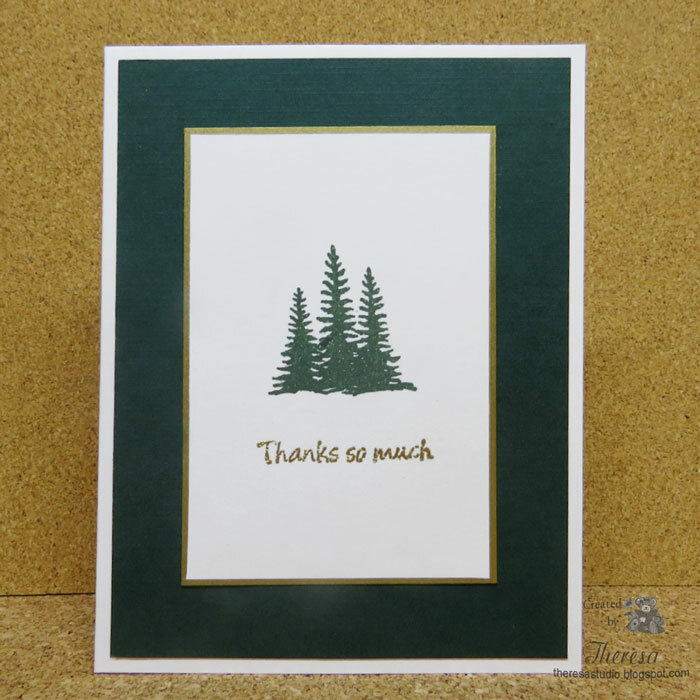 The stamped image layer was edged with gold metallic marker and placed on a Brown card base. Making this post quick and short. Hello! My second card today has the theme of Thinking Of You but I added an inside message that makes it a Christmas card for a special person. I printed a digital image of Poppies by Crafty Secrets on Watercolor paper and colored with a water brush and Distress Inks. 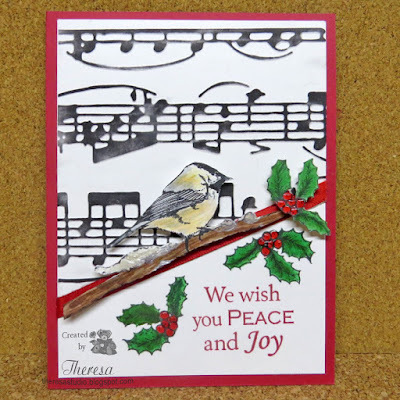 I added a sentiment from Gina K Designs with Memento Tuxedo Black that I embossed with Clear EP. I simply finished with a layer of Black CS and a card base of Green CS. I finished the inside saying "With Love This Christmas Season" (printed on computer) and stamped another sentiment with Gina K Stamps. Simon Says Wednesday: Simon says Thinking of You. Welcome! I love birds especially cute chickadees. 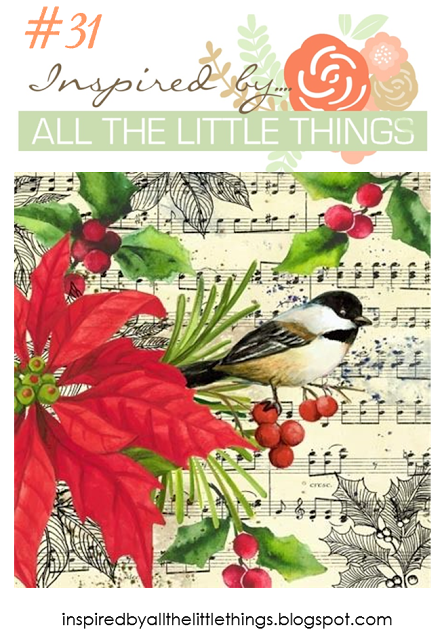 I was inspired to get out this Chickadee Stamp from Gina K Stamps by the challenge at Inspired by All The Little Things challenge. I combined it with a Musical EF Allegro by Cuttlebug and some Holly stamps from Flourishes using the Sketch from CAS(E) this Sketch to create this Christmas card. Other supplies used: Memento Tuxedo Black, Northern Pine, and Rhubarb Stalk inks; Copics markers; MFP sentiment; Red and White CS; Glossy Accents; Stickles; Red Satin ribbon..
City Crafter Challenge Blog: Challenge 337 Use Ebony and Ivory-use music related items such as musical notes. Hello! I baked up a two layer cake for my tag to enter the challenge at Tag You're It! this week. 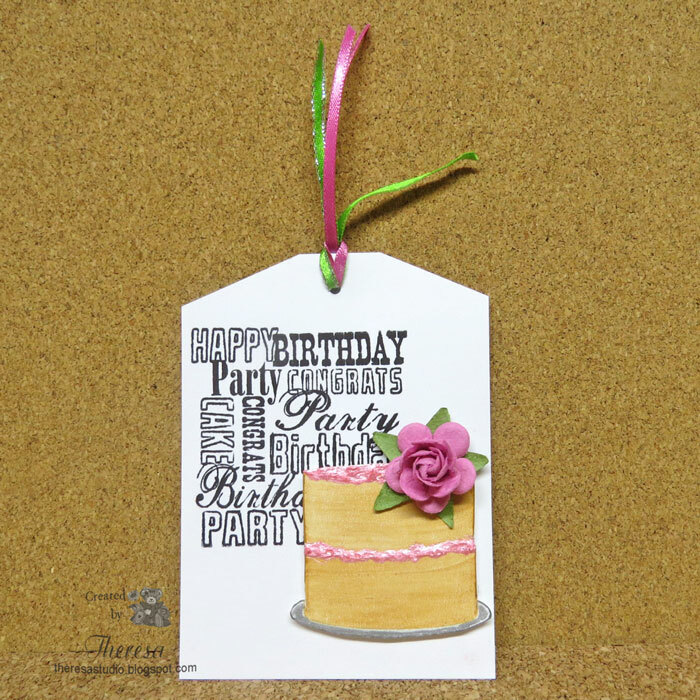 I used a cake stamp from Gina K Designs and Birthday Words stamp from Inkadinkado to create a similar look to Rubeena's tag #59 shown below. Finished with some icing of pink stickles, a pink rose and ribbons from stash. 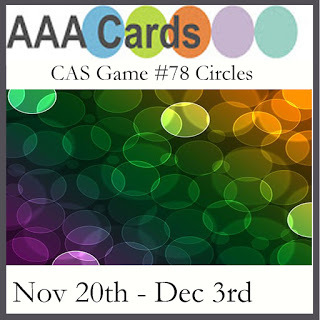 Cute Card Thursday: Challenge 450 Anything but a card. Crafty Ribbon Challenge: #174 Anything goes with ribbon. Really Reasonable Ribbon: Challenge #152 Tag You're It with ribbon or trim.